This month, CDC and U.S. government agencies launched a six-month progress reportCdc-pdf on the White House’s National Action Plan for Combatting Multidrug-Resistant TB. This report underscores activities taken by the CDC and supporting partners in support of the National Action Plan (NAP) during its first six months.The three main goals of the NAP consist of upgrading TB surveillance, strengthening state and local transmission prevention programs, and that ensuring patients with multidrug-resistant TB (MDR TB) receive treatment until they are cured. With nearly 500,000 MDR TB cases globally in 2015, this report reiterates the urgent need to improve quality of treatment and expedite diagnostics. MDR TB is resistant to at least two of the first-line drugs used to treat TB, and is now found in every country in the world. MDR TB remains a growing threat around the world, further emphasizing the need to find, cure, and prevent TB at the earliest stages of infection. Despite being preventable and curable, TB ranks alongside HIV as the top cause of death from infectious disease globally. 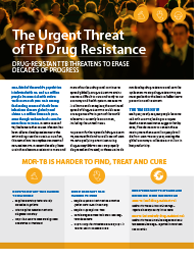 Compared to TB that is not drug resistant, MDR TB takes a hefty human and economic toll – it requires longer treatment times and costlier drugs, can cause serious and permanent side effects, and significantly increases the risk of death. If left unchecked, 75 million additional people could die from MDR TB by 2050, costing the global economy $17 trillion in lost productivity. 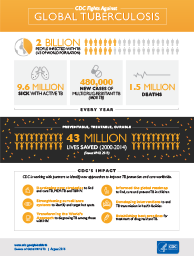 The impact of MDR TB around the world and CDC’s work with partners to fight this epidemic around the world, click hereCdc-pdf. To get a snapshot of the burden of TB worldwide and CDC’s efforts to combat this epidemic, click hereCdc-pdf. Thomas R. Frieden, M.D., M.P.H., former director of the Centers for Disease Control and Prevention speaks about his personal experience with the disease. In this video, he discusses how he developed latent TB infection and introduces the poignant stories of health workers who contracted TB while caring for others. Dalene von Delft, a young South African doctor, developed MDR TB while treating patients. After years of toxic treatments, facing the prospect of deafness and even death, she was finally cured of her TB. Now, as a full time ER doctor, she and her husband have dedicated their lives to advocating on behalf of TB sufferers around the world. Dr. Forno has spent decades working on the front lines with Ministries of Health and partners to control TB in some of the hardest-hit countries in Central America.